Angelo Perera acknowledging his century for Sri Lanka ‘A’ against Ireland ‘A’ in the first unofficial test at Hambantota. Since breaking into the Sri Lanka team six years ago Angelo Perera, NCC’s powerful middle-order batsman has had only limited opportunities of representing his country. To be precise he has in those years appeared in only 4 ODIs and 2 T20Is. So what better way to make the national selectors sit up and take notice of him than to come up with a unique batting performance which only one man before him has achieved in the entire history of the game. On Friday Perera scored 201 for NCC in their 4-day Premier League Tier A Super 8 match against arch rivals SSC at the historic P Sara Oval, venue of many memorable matches helping his club to a total of 444. But when SSC surpassed that score by 36 runs making 480, there was nothing left in the game for NCC. “We were actually planning on declaring but after that we decided to bat on because we didn’t have any chance of winning the tournament,” said Perera. That late decision enabled Perera to create history as NCC went onto notch up a massive 579-6 in their second innings on the final day (Sunday) with Perera contributing a memorable 231 off 268 balls. NCC were wobbling at 44-3 when Pathum Nissanka (165) a potential Test opener and Perera came together in a match-saving fourth wicket stand of 267 to ensure a draw. This was actually Perera’s third first-class double hundred of his career having earlier made a career best 244 against Air Force in 2015. However he had shown a penchant for making double hundreds at an early age having scored two for his alma mater St Peter’s College Bambalapitiya at under 14 level and one at under 19. In six matches for NCC this season Perera averages 88.20 with 882 runs inclusive of four hundreds. Against Ireland ‘A’ in the first unofficial test at Hambantota which Sri Lanka ‘A’ won he scored an authoritative 127 off 161 balls. Overall he has a first-class average of 47.54 with nearly 7000 runs and 18 hundreds. He has one more match for NCC before the season ends and he hopes to make an impact on that as well. Initially Perera had an aggressive approach to his batting and it was no surprise to see him being picked to represent his country in the two shorter formats – 50 overs and 20 overs in the initial part of his career. “I used to be a very attacking player but now with time, age and maturity I’ve decided that it is not the best. I have been building my innings very steadily. Credit should go to Mr Ruwin Peiris and club coach Duminda Perera, and also the ‘A’ team coaching staff. I have been working with Lanka de Silva and Avishka Gunawardene for some time. The few technical changes I’ve made and the work that I have put in with them, plenty of hours, has paid off,” said Perera. Usually it is the parents who get involved in the career of their son but in Perera’s case it is his 80-year-old grandfather Sivananda Raja who has followed his cricket closely. “My parents don’t get involved at all but my grandfather is an ardent fan. He is the one who follows my career closely. If I don’t score runs he is very upset about it. He has been watching me from my college days till now. He eagerly waits for my scores to know what happened,” said Perera whose father Nalin Perera is CEO of Mobitel (Sri Lanka). “The important advice I’ve got is to make sure you grab every opportunity you get in any game of cricket. It is always a chance to prove yourself. At the end of the day if you score or not you should be happy to know that you have given 100 percent. “If you do well or not still if you know that you have worked hard towards your goal that’s the best advice you can get. “At the moment I am keen on grabbing any opportunity that comes my way not necessarily getting into the Test side. Any format of the game I will be happy,” he said. 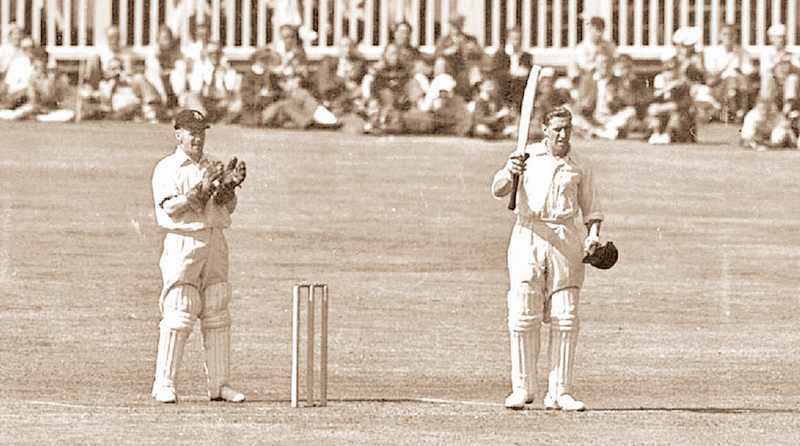 Arthur Fagg of Kent celebrates scoring his second double hundred of the match against Essex at Colchester in 1938.